AWS CodeStar uses AWS Identity and Access Management (IAM) to manage developer identities and provides built-in, role-based security policies that allow you to easily secure access to your team. AWS CodeStar allows you to share your projects using three levels of access: owners, contributors, and viewers. 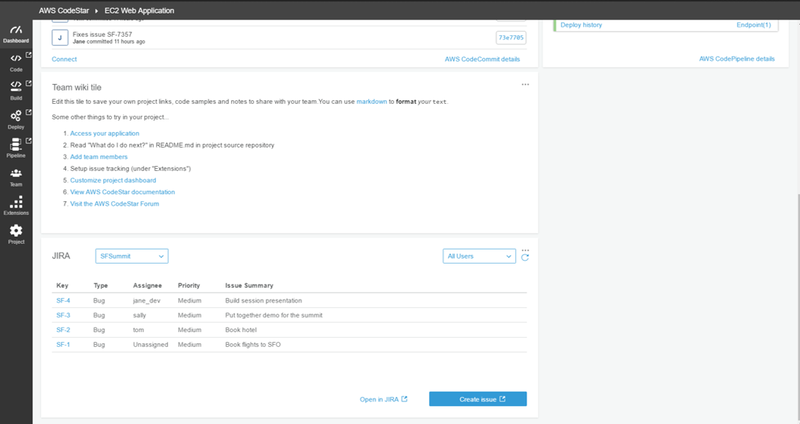 AWS CodeStar stores your application code securely on AWS CodeCommit, a fully-managed source control service that eliminates the need to manage your own infrastructure to host Git repositories. You can also choose to have your project source code stored in a GitHub repository in your own GitHub account. AWS CodeStar compiles and packages your source code with AWS CodeBuild, a fully-managed build service that makes it possible for you to build, test, and integrate code more frequently. 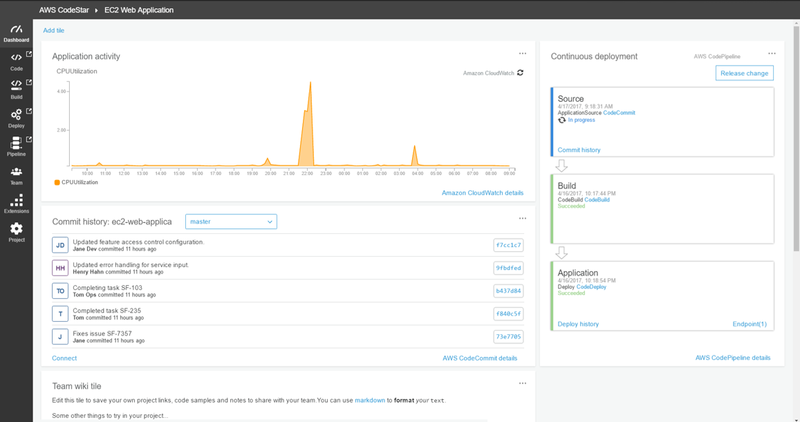 AWS CodeStar accelerates software release with the help of AWS CodePipeline, a continuous integration and continuous delivery (CI/CD) service. Each project comes pre-configured with an automated pipeline that continuously builds, tests, and deploys your code with each commit. AWS CodeStar integrates with AWS CodeDeploy and AWS CloudFormation so that you can easily update your application code and deploy to Amazon EC2 and AWS Lambda. After you create a project in AWS CodeStar, you can begin developing your code directly in AWS Cloud9, which makes it easy to get started developing on AWS. Cloud9 is a cloud-based IDE that lets you write, run, and debug your code with just a browser. Cloud9 comes with a terminal that has a pre-authenticated AWS Command Line Interface giving you immediate access to a broad spectrum of AWS service. In addition to Cloud9, CodeStar allows you to pick from a number of other popular IDEs such as Microsoft Visual Studio and Eclipse. AWS CodeStar projects include a unified dashboard, so you can easily track and manage your end-to-end development toolchain. With the project dashboard, you can centrally manage activity for your CI/CD pipeline, such as code commits, builds, tests, and deployments and take remedial action where needed. AWS CodeStar also includes a project wiki, making it easy for you to provide team information such as project links, code samples, and team notes. AWS CodeStar also integrates with Amazon CloudWatch, an application monitoring service, and Atlassian JIRA Software, a third-party issue tracking and project management tool. These integrations allow you to centrally monitor application activity and manage JIRA issues in the AWS CodeStar dashboard.